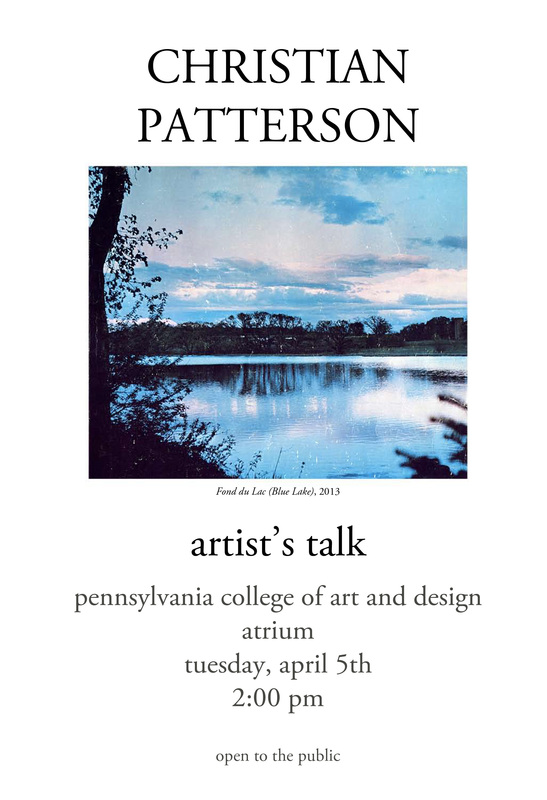 Christian Patterson will give an Artist Talk in PCA&D's Atrium on Tuesday April 5, 2 p.m., and will meet with the Photography majors after his presentation. Patterson was born in Fond du Lac, Wisconsin and lives in New York, New York. Photographs are the heart of his work and are sometimes accompanied by drawings, paintings, objects or sound. In 2015 he published his latest work Bottom of the Lake. He is a 2013 Guggenheim Fellow and in 2015 he won the Vevey International Photography Award. Patterson is self-taught but lectures widely about his work. The first printing of Bottom of the Lake, published last year, is already out of print and awaiting a second printing. His work Redheaded Peckerwood, about a crime/murder spree in the Midwest during the mid-1950s, won the 2012 Recontres d’Arles Author Book Award and is now in its third printing. He is represented by Rose Gallery in Santa Monica and Robert Morat in Hamburg and Berlin. The Artist Talk is open to the public.